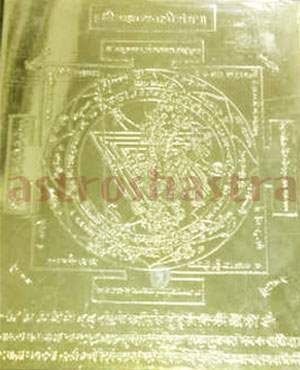 Sizes available : 4"X4" , 6"X6" , 8"X8"
Kali Yantra bestows on the sadhaka fulfilment of all his desires, wealth, comforts of life and is used for Mohan or Vashikaran purposes. It is very powerful and tested . This is embossed on copper plate and is Gold plated . Goddess Kali is deity of this yantra. This is composed of a Central Point (bindu) within five inverted traingles, three circles, eight petals inside and outsides, is enclosed in four doors, is written on silver or copper plates. It is also called as Dakshin Kaali, Shamshan Kaali, Bhadra Kaali, Sasaan Kaali, Guhya Kaali, Kaal Kaali and Siddhi Kaali Yantra. Worship of this Yantra is claimed to be an infallible device. Daily recitation of its Mantra and its worship automatically fulfills the desires, bestows wealth & prosperity and ward off ill effects, diseases & obstacles apart from defeat/decimation of adversaries. This Yantra takes care of harmful effects of Saturn which is usually responsible for all types of misfortunes, sufferings and sorrows. Any person using this Yantra is protected against planetary afflictions and their malefic effects as well as accidents/dangers. It also bestows long life to the native. One must worship the Goddess with rice and ghee, reciting its Beej mantra- “Om Kreeng Hreeng Huang Kaalikaye Namah” . If silver pendant is worn after its Pooja, this Yantra is the surest remedy against chronic diseases like Paralysis, Nervous breadown, Cancer, heart problems and protects from all types of evil forces. It can be placed in your place of worship or can be hung on the east wall of house for your protection. It bestows fulfilment of desires, wealth, comforts of life and is used for Mohan, Vashikaran purposes. 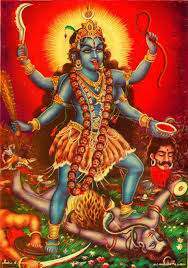 Lot of power is infused after pooja and is capable of controlling enemies to not do any harm. A unique and powerful yantra.